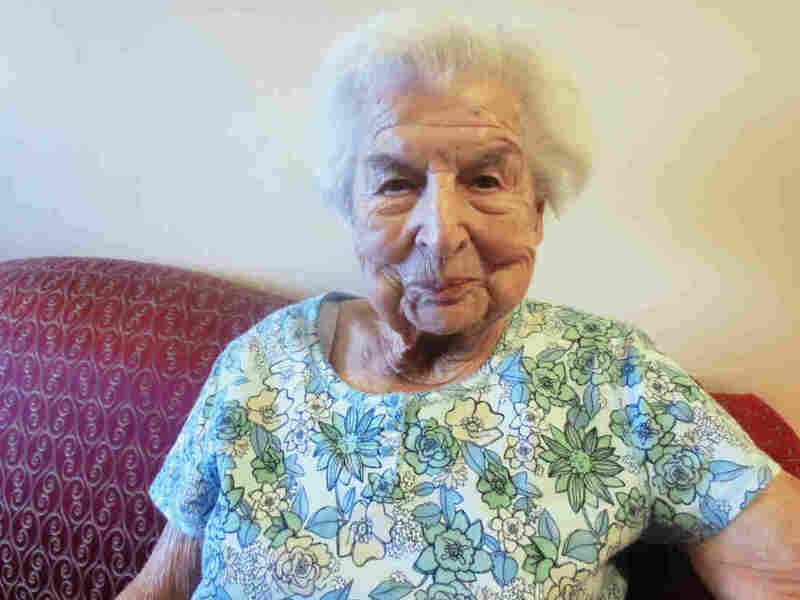 At 102, Reflections On Race And The End Of Life Rosa Finnegan worked until she was 101. Even now, she says, she's still learning things about herself. "Even as old as I am," she says, "you think you're not prejudiced, but all of a sudden you really find out you are. How stupid I was. 'Cause before you know it, it's all over." Rosa Finnegan in her nursing home. "As nice as this place is," she says, "there's an undercurrent — it's sad, also. I get up now in the morning and I'll say to myself, 'What am I gonna do all day now?' "
Below are excerpts from Rosa's interview, reported and produced by Ari Daniel and Caitrin Lynch. Let me tell you something that happened to me here two months ago. It's going to be a little hard to talk about this because I'm ashamed of myself, in plain English. One day, they came and asked me if I'd like to move to another room. And when I was taken to the other room, I saw Ada, a black lady sitting there in her wheelchair with her oxygen tank beside her. And we had a nice little chat, and I left. But first thing I noticed was that she wasn't white like I am, which is the thing that stopped me from moving into the room with her. And when I got back to my own room, I sat there and I said, "What did I just do? Rosa, you're not a nice person at all." I felt very bad about that, so every time I went by her room, I would go in and sit and talk with her. ... I felt kind of warm every time I went in to talk to her. And we got to be friends. Even as old as I am, you think you're not prejudiced, but all of a sudden you really find out you are. How stupid I was. 'Cause before you know it, it's all over. Thank God I had a chance to really get to know this wonderful woman. I always felt that I could work forever. Made me feel like I was a worthwhile person. I liked the companionship of people around me, and we're all working. I really feel like a dope. I should never have stopped. That was the sorriest day of my life. As nice as this place is, there's an undercurrent — it's sad, also. I get up now in the morning, and I'll say to myself, "What am I gonna do all day now?" I think about my life, the way it used to be. Then I say, "Oh, don't be so crazy. It can't stay the same forever, and you can't live forever." Just think how crowded we'd be if no one ever died. So some days I feel very blue. Other days, I get up and say, "Well, the sun is shining, it's gonna set pretty shortly, I hope." I try not to be sad about it because I'll be kind of glad to go. Wherever I'm going, I'm glad I'm gonna go.